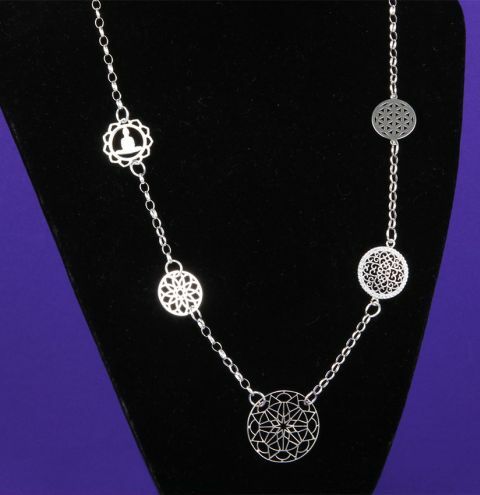 Use a mix of sterling silver mandala charms and connectors to create a delicate and peaceful necklace. Starting from the bottom of the necklace attach a 1 inch piece of chain to either side of your star mandala charm using jumprings. To the left side, use a jumpring to attach the daisy mandala connector to the piece of chain. To the right, attach a cubic zirconia filigree coin. Add another jumpring and 1 inch piece of chain to each connector. Attach the buddah mandala and a small daisy connector like before. Attach a 4.5 inch piece of chain to each of the connectors, finish the necklace with a lobster clasp and jumpring.